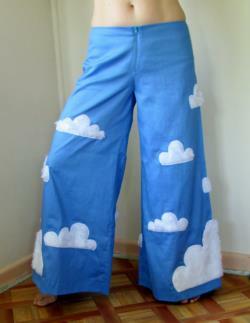 These bottom hugging, hipster wide leg phat pants are great for a rave. 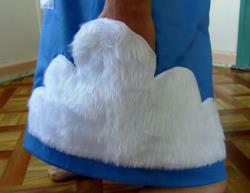 They are size 10-12au and are made of thick sky blue cotton drill and feature white fluffy clouds. 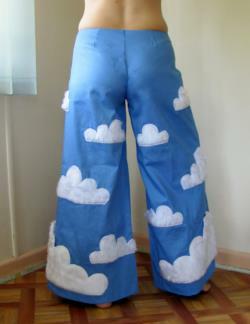 The bottom outside clouds are actually pockets, awesome for carrying those extras . The wide leg circumference measures approximately 86cm at the hem. 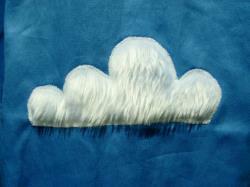 I can also make them in any size or colour, so please don't hesitate to ask me. I can also make a male version, which is not so bottom/ball hugging and a little higher waist.